Hundreds of fires have burned around the province. Prime Minister Justin Trudeau meets firefighters, members of the Canadian Forces and RCMP officers in Williams Lake, B.C., on July 31, 2017. WILLIAMS LAKE, B.C. — Prime Minister Justin Trudeau says he was impressed by the extraordinary work of firefighters as he toured the fire-blackened remains of British Columbia's Cariboo region by helicopter on Monday. Trudeau said he saw where flames had jumped about a kilometre across a canyon above the Fraser River. "The speed at which it can flare up, the way it could cut across roads, really impressed upon me the extraordinary work being done by our wildfire professionals,'' he said. Trudeau, accompanied by several politicians including B.C. Premier John Horgan, spent an hour above the fire zone watching spot fires and smoke billowing from the area. He said he recognized how difficult it was for people in the fire zones to be ready to leave at a moment's notice and how costly it has been for businesses and the local economy. "There will be challenges in the months to come that we will also be there for. This is what Canadians do, we stand up for each other in times of difficulty,'' Trudeau said. Horgan said the fire situation has been especially hard on the residents of the Cariboo, where thousands of people were forced from their homes. "We're going to make sure people are whole when this is all over,'' he promised. About 6,000 people remained displaced in B.C. by the nearly 150 fires that were still burning on Monday. 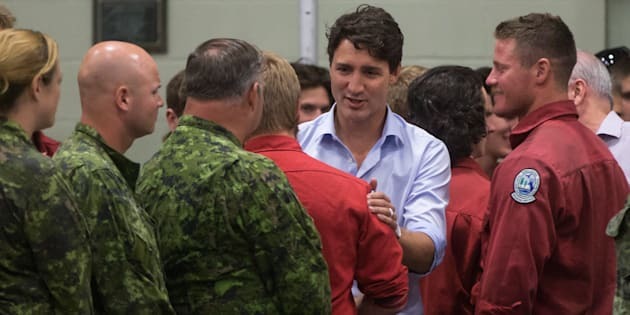 Earlier in the day, Trudeau thanked those on the front lines of firefighting efforts for "stepping up,'' saying it is reassuring for people to see everybody pulling together. He addressed about 250 people from the fire service, police and military for helping to keep the wildfires from overrunning communities in what has been a devastating fire season. Dozens of homes have been lost as more than 800 fires have burned around the province, scorching about 4,200 square kilometres. Burnt trees are pictured in front of a smoke-filled sky near Old Fort, B.C. on July 11, 2017. Several hundred residents cheered as Trudeau and Horgan emerged from a recreation centre, and the cheering grew even louder as the fire service personnel filed out of the building. Thousands of Williams Lake residents returned to their homes over the weekend after they were forced to leave on July 15 when a fast-moving fire encroached on their community. The prime minister also sat down for lunch and a chat with some BC Wildfire Service personnel, many wearing the red coveralls of the firefighters. "What do you do in the winter?'' Trudeau was heard asking some of the crew. He and Horgan then took a tour of the fire operations centre at the Williams Lake Airport. Kevin Skrepnek, chief fire information officer with the BC Wildfire Service, said the visit means "a great deal'' to fire crews who have been impacted both personally and professionally by the aggressive fire season. Many staff were among the people evacuated from Williams Lake and had to sleep in tents or in their offices while responding to a number of fires around the community, he said. "I would say it's a morale booster in terms of having those kinds of visits,'' Skrepnek said. The political visit comes as the forecast calls for another week of hot, dry weather. Environment Canada has issued a special warning about a heat wave for Metro Vancouver, the Fraser Valley, Howe Sound and several parts of Vancouver Island. Residents have been told to expect daytime temperatures to soar to the upper 30s. A forecast of lightning in the Interior, where the majority of the fires are already burning, could make the fire situation even worse. Smoke from fires in both B.C. and Washington state could also pose a problem for crews, reducing visibility for aircraft detecting and fighting the flames and making it unsafe for them to fly, Skrepnek said. A wildfire burns on a mountain in the distance east of Cache Creek behind a trailer park that was almost completely destroyed by wildfire, in Boston Flats, B.C., in the early morning hours of July 10, 2017. He said winds were forecast to push the haze west to the coast by Tuesday. An air quality advisory has also been issued for Metro Vancouver and the Fraser Valley as smoke from B.C. 's Interior wafts into the region.